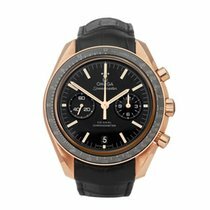 This is a pre-owned Omega Speedmaster dark side of the moon men's 31192445101006 watch. 44.25mm case size in black ceramic, black baton dial on a brown leather bracelet, powered by an automatic movement. This Omega is in unworn condition complete with box, manuals & guarantee dated 15th October 2018. Our Xupes reference is W5486 should you need to quote this.